I have often been censured that my demeanour gives the impression of being an extremely grave and solemn person, aloof and at times snobbish and devoid of a sense of humour. Nothing could be further from the truth. Probably I'm not the typical outgoing extrovert Sagittarian or probably because I'm a typical Sagittarian I value my freedom enormously and this independence makes me a bit reserved and take time to accept a level of familiarity which I share with those close to me. Any case, just to counter this alleged accusation I have decided to include “Mirthful Musings”, a column article in Sindhishaan commencing with this issue, which will be related to the Sindhi community and maybe at times satirical. But as is often said the test for a sense of humour is whether you can laugh at yourself. The second quarter of this year began on a sad note. SINDHISHAAN, and I personally, lost a dear friend, philosopher and guide with the demise of Dada Jhamatmal Wadhwani. May God give his family the courage and strength to support and continue, in a similar vein, service to Sindhyat, a task to which Dada was comprehensively devoted. 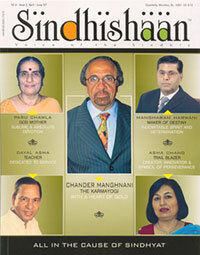 On a positive note the quarter saw the emergence of concrete hope for the Sindhi Visual Media. Telecasts of Asha Chand's “Sindhi Surhaan” on Sahayadri Doordarshan have warmed the cockles of our hearts; and business magnate M. Harwani's announcement of the forthcoming release of 'Pyar Kare Dis' and 4 more films in Sindhi have sent the community riding a glorious high. This issue features both these personalities. This issue contains two more articles penned by me which are of relevance to the 14th International Sindhi Sammelan to be held in Singapore from July 27th to 29th 2007. I sincerely hope there will be debate and discussion on the issue raised, not at the Sammelan only but amongst the entire Sindhi diaspora. It will be my privilege to receive your views and feedback.